A year ago ChronoSoft brought us the dungeon crawler Rogue Touch [App Store], included in our Best Games of 2009 roundup and my personal favorite iPhone roguelike. The game has been well-supported by the developer and has gathered quite a following in our forums. Over the past few months, however, developer Kevin Hill has been fairly quiet, leading us to wonder just what he’s been up to. As it turns out, with the roguelike formula held firmly in mind, Kevin’s been busy at work on a new iPhone game. 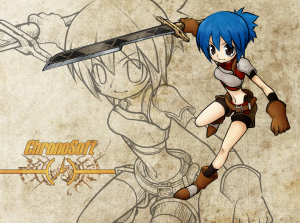 Yesterday, in our forums, Kevin announced his forthcoming title Spirit Hunter Mineko: Demon’s Reach. 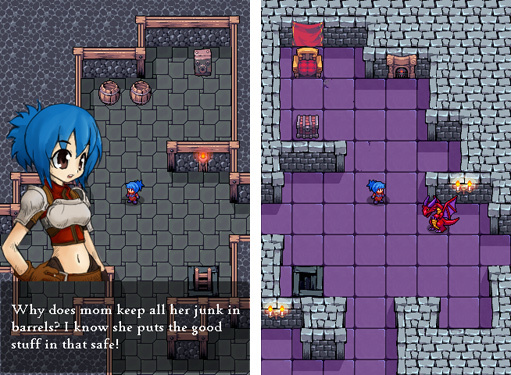 Spirit Hunter Mineko: Demon’s Reach is a roguelike / dungeon crawler with a bit of a backstory. The game centers around Mineko, an average teenage girl who enjoys exploration, spelunking, and sparring with tough monsters. Stubborn, short-tempered, and rebellious, Mineko lives with her family in a secluded mountaintop village. She is a Spirit Hunter, trained from a young age in the art of channeling her spirit to perform magical feats. And while she demonstrates great skill, she is still treated like a child by her village. However, Mineko’s chance to prove herself has just arrived. One dark night a vicious storm kicks up, tearing through the valley below and whistling through the peaks that she calls home. Upon waking the next day, Mineko and every last member of the village are amazed to see that this was no ordinary storm! Down in the valley that previously contained nothing but dense forest, a huge castle has materialized… apparently from thin air! Its sinister appearance, as though an enormous evil hand was stretching out of the earth towards some unseen desire, immediately earns it the name “Demons Reach". The village council decides to send a scout into the valley to investigate and, in a move that infuriates Mineko, her brother is chosen for the task. Not one to mope about the house, Mineko grabs up her dagger and crossbow, opens the hidden door in the floor of her bedroom, and it’s off to high adventure she goes. Spirit Hunter Mineko, while a dungeon crawler like Rogue Touch, is rather more similar to some of the iconic SNES and Gameboy Advance adventures of the past. It features a unique world with monsters, gameplay mechanics, and graphics not inspired by any existing roguelike. Unlike the much more graphically simple Rogue Touch, the new title is an OpenGL ES-based affair featuring smooth-scrolling travel through the game’s various levels. As the development of the title progresses, detailed animations and particle effects will come into play, as well. The developer likens his vision of the completed title to Shiren the Wanderer for the DS. Kevin has just posted an early video of the game that serves as more of a “tech demo" of the game system as it stands currently than a demonstration of any meaningful gameplay. The developer tells us that, while the early video demonstrates his line-of-sight algorithm, he plans to finesse the system with a smooth-shadow effect before release. He also indicates that the onscreen mini-map, in the final game, will start small and slowly fill out as you explore the randomly-generated levels. And, while the video shows only the game’s dungeon environments, there are currently four different environments / tilesets planned for the release version. We’re told that there’s much left to do in this title before it’s ready for the App Store, but, remembering Rogue Touch, we’re rather confident that the end result will be worth the wait. Stay tuned for more on ChronoSoft’s Spirit Hunter Mineko: Demon’s Reach down the road.